I don't have much to say at the best of times, but when my job gets hectic (that is, even more hectic than usual) I do tend to shut down. My Forum friends will agree with that, they haven't heard from me for ages. Sorry! And some sad memories have been on my mind lately, I've been missing what could have been. But let's not talk about that, I do appreciate that I'm very fortunate in many parts of my life. I'm single so I can indulge my need for a lot of quiet time, and I get a good paycheck so I can indulge my craft addiction. So here's a peak at what I've been doing with all my time over the past couple of weeks. 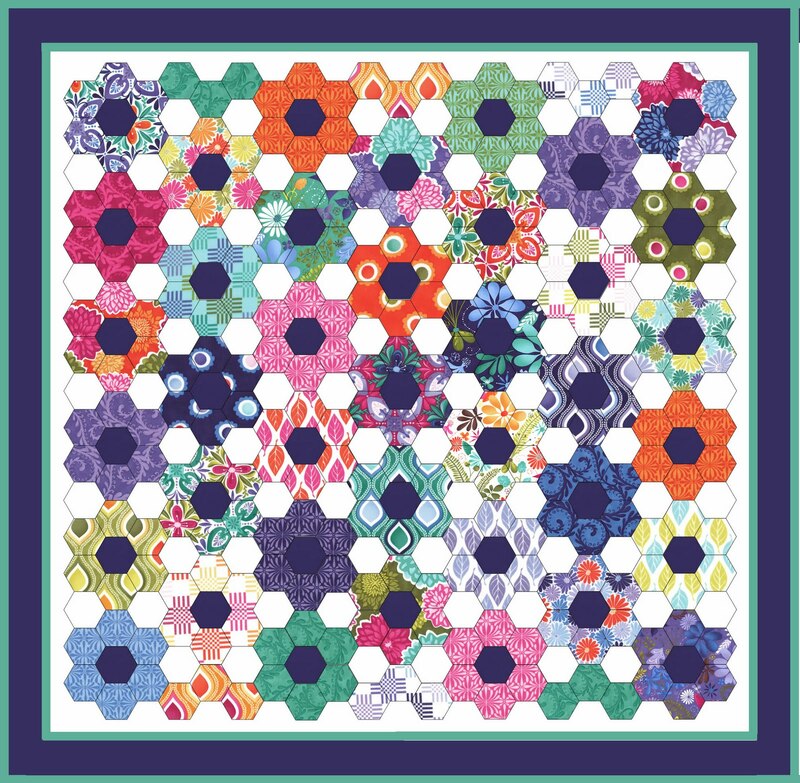 I tried and tried to resist starting another quilt (because I am so close to the end of piecing this quilt) but I obviously didn't resist hard enough. 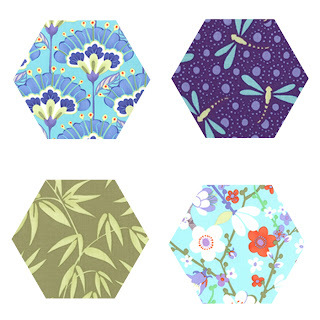 I gave in to temptation the Tuesday before last and cracked open a pack of pre-cut hexagons. I couldn't resist the Terrain. It was like opening a little gift box of mixed chocolates! You're not quite sure what's in there, but it's fun finding out. I glue-penned the pre-cuts to my templates in no time at all. 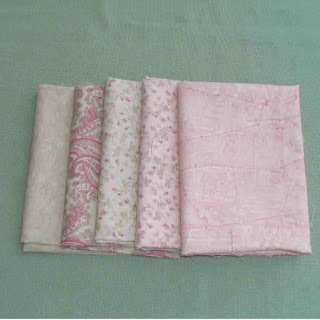 Here's a picture of some of them ready to stitch. I have since stitched up all the hexie-flowers and am half-way through piecing them together. I'm not entirely convinced that white is a good in-betweener, but the deep purple centres are absolutely perfect. Here's where I'm up to. I'm pleased to say that it looks fantastic in real life. I'm so thrilled with it. I am racing through this project as fast as I can (because I have a feeling that once I've put these hexie-flowers together, I might be tempted to crack open another pack and turn this small quilt into a large one). So bye for now, I've got to get stuck into Row 5. P.S. There's still time to enter the giveaway below. Did I mention that I'm drawing it on my birthday, Saturday 5 November? Giveaway 4 - Ooh la la! I promised another giveaway over a week ago, and here it is. This giveaway is open to all Australian and International visitors, and there are three prizes altogether. Or should I say trois prix, as this is a French-themed giveaway. The first winner pulled out of my chapeau can choose a pack of pre-cut fabric hexagons from either the Fa la la la la range or the Rounneries Deux range by Moda. 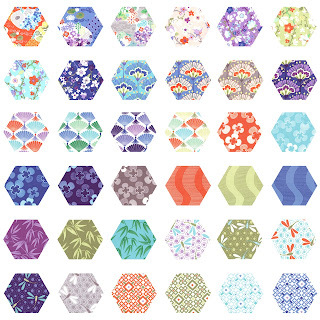 Each pack contains close to 300 pre-cut fabric hexagons from close to 40 different fabrics. 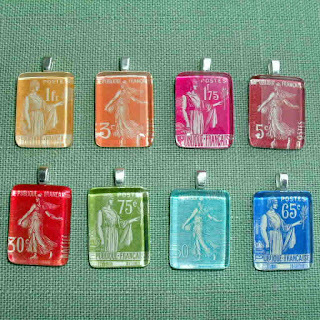 The second winner will receive these pieces from my stash. They are from one of my first favourite fabric ranges, the lovely Paris Flea Market by Moda. They came out quite a few years ago, but who can forget the Paris city street map in ballet slipper pink. This giveaway is open to all, and is open until 9.00 pm 5 November, Sydney Australia time. To enter, leave one comment below telling us your favourite French word/s. (I'm guessing that chocolat will popular.) If you can't leave a comment, you are welcome to email me. The winners will be randomly drawn. P.S. 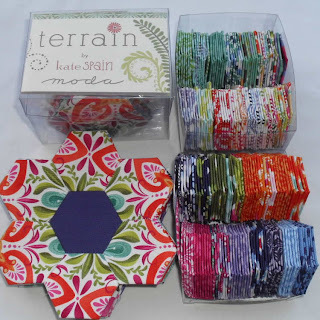 I said the winner could choose from either Fa la la la la or Rounneries Deux, but actually you are welcome to select any pack of pre-cuts from my store. I have to confess that I opened one of the Terrain packs for myself last Tuesday night. P.P.S. I'll extend my October free offer to coincide with the end of the giveaway. 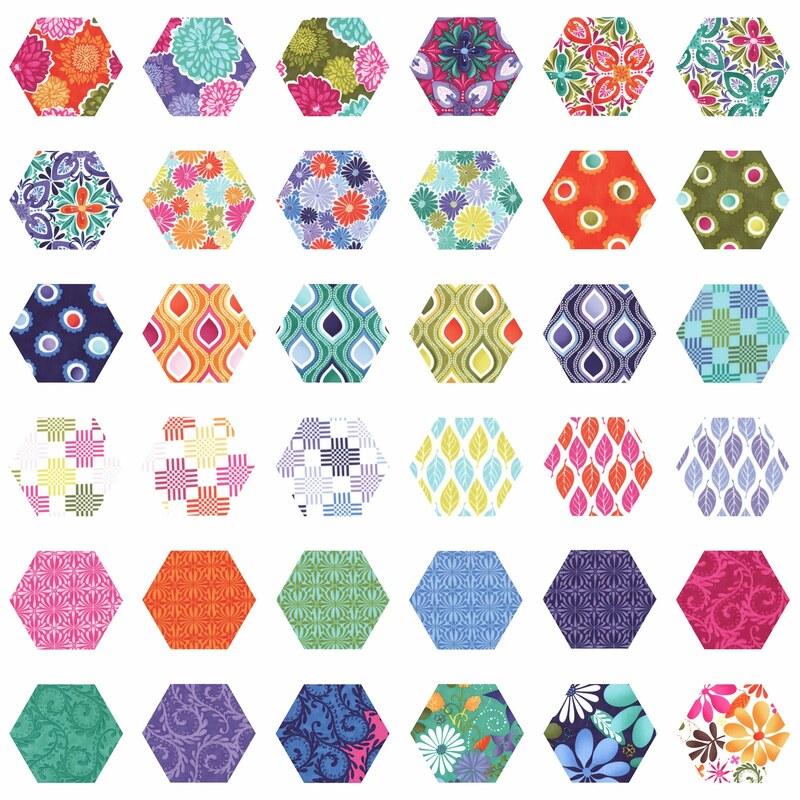 Buy any pack of pre-cut fabric hexagons from any of the Moda ranges between now and 5 November and receive a free pack of paper or card 1" hexagons. Hi Everyone, I'm really enjoying all your comments. Tres amusement! Thank you all so much. I worked like a wild thing all weekend to add LOTS of new items to my store. 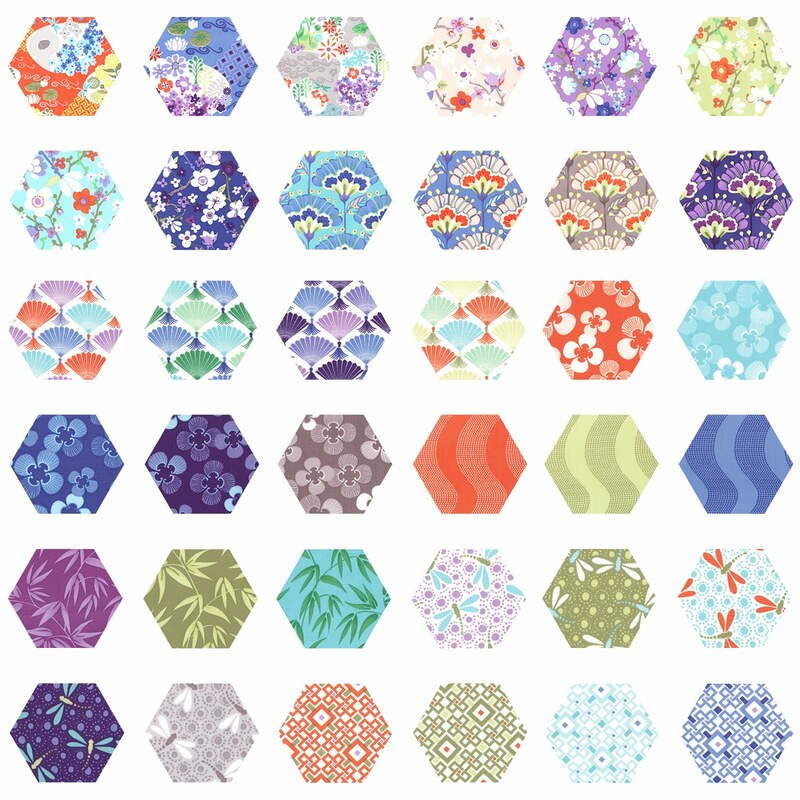 I now have packs of pre-cut fabric hexagons available in 18 (yes 18!) 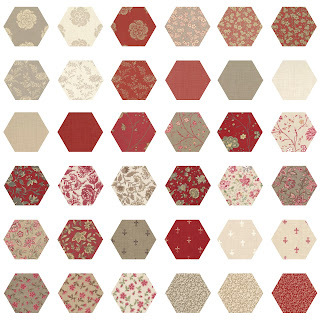 different Moda fabric ranges. The latest additions include Fa la la la la, Rounneries Deux, Collections for a Cause - Hope and Collections for a Cause - Comfort. 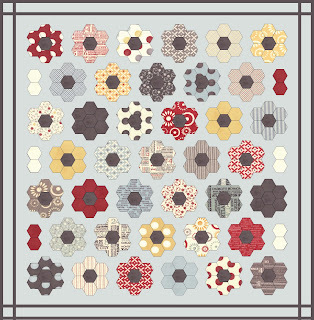 If you prefer bright fresh moderns, I've added Giddy, Sassy and Ruby and Reunion. Plus, a brand new favourite, Good Fortune. I've also added an extra item called "Free Offer". I'm sure it's not hard to guess what it is. 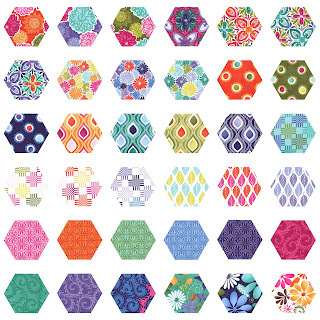 Buy any pack of pre-cut fabric hexagons from the Moda range and get a pack of 1" hexagons for free. 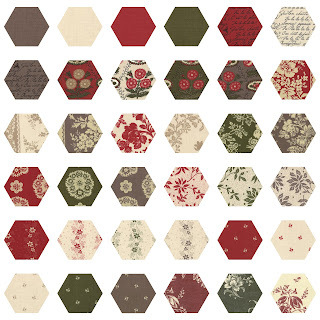 Free pack can be either 100 paper, 100 card, or 50 paper/50 card hexagons. Free offer available until 31 Oct. Browse here to see all the new pre-cut packs (and the ones that were already there). I hope you see something you like. Chookyblue, this post is for you! Chookyblue, this post is for you! Thanks for your inspired suggestion. Here's the Rough Terrain layout using a pack of my Hometown Pre-cut Hexagons. I guess I should call it Rough Hometown LOL. I'm calling them "rough" because the final design details are unfinished. 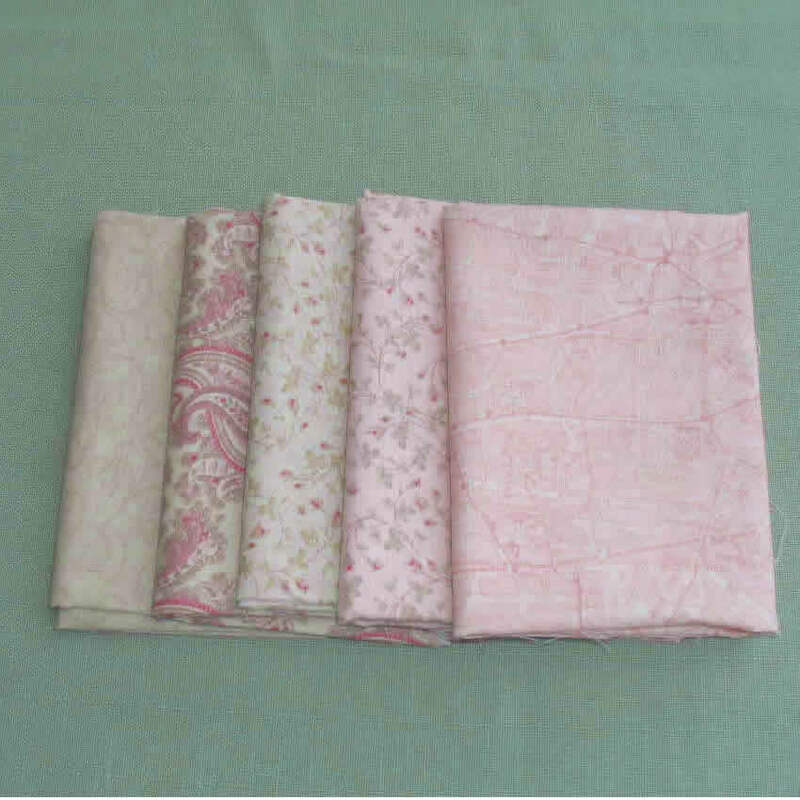 I don't think you can know what a quilt will look like when you just see it on-screen, you have to see it in real life. That way you can balance out the light and dark, the proportions and placement, and experiement with some finishing touches. I think the Red looks a little overpowering in this one. Maybe it needs a bit more open space between the hexie-flowers. I usually piece my in-between rows, but if you appliqued the hexie-flowers on instead, you could play around with it until you found just the right balance of open space. But my favourite tonight is this one with a softer gentler yellow colourway. You can only see the hexie-flowers on-screen, but in my mind I can see finished off with a stylised curvy vine design appliqued on the yellow border and lots of swirly quilting all over. 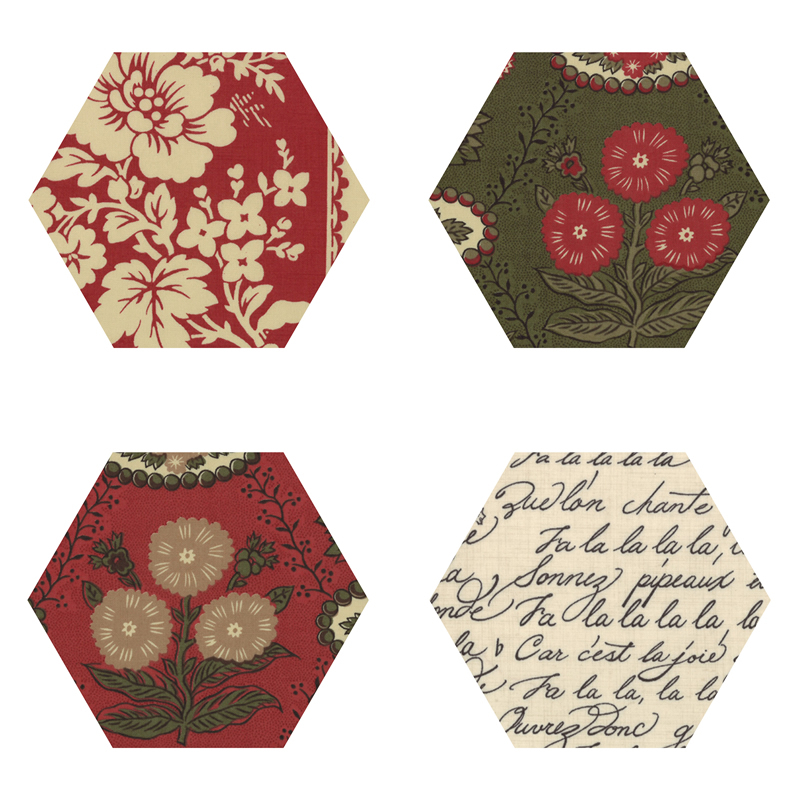 I have a limited number of packs of Hometown Pre-cut Hexagons available here in the 1 1/2" size to go with 1" templates. Larger amounts or larger sizes can be custom-made on request. Crafters are such a generous bunch! 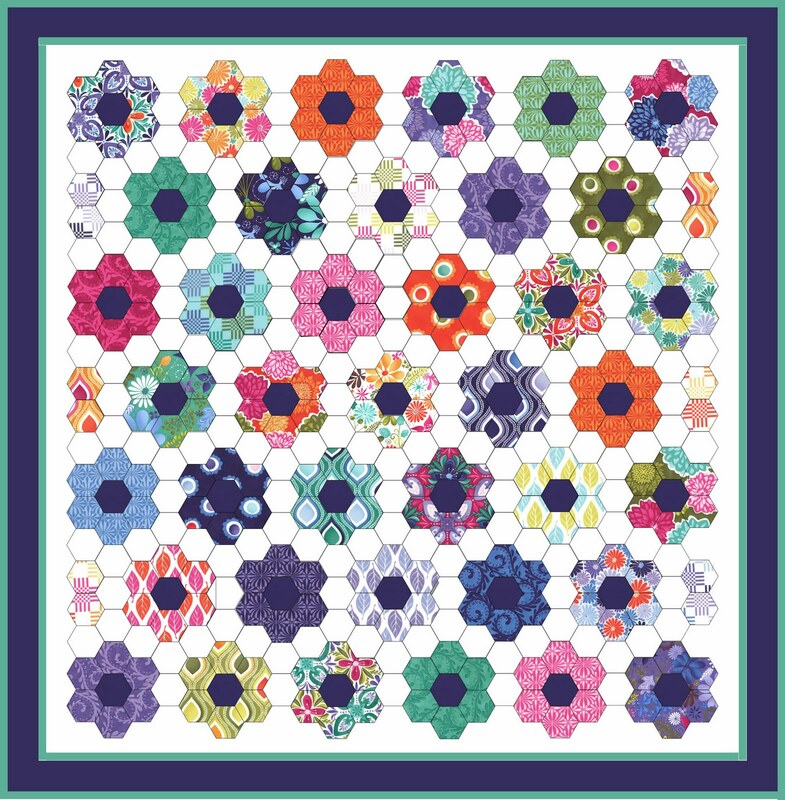 I keep finding inchy hexie flowers in my letterbox, which are the perfect flowers for me because I am allergic to most others. They often show up for no reason, not as part of a swap, and it's always a lovely un-hex-pected surprise. (OK OK, that was a really really bad pun I know.) They always seem to show when I really need a pick-me-up (although I have to admit you could pick any weekday and that would apply). Now that the purple has arrived it is so tempting to crack open a pack of Terrain fabric hexagons and get started on another new quilt, but I am determined to finish my Faux Wedding Ring first. And I have a great idea for a giveaway which I really want to make for you this weekend. (That's what I said last weekend.) No hints, except to say "Oo la la, J'adore fabrique". OK, I give in, here's a visual hint too. And tomorrow is the deadline for this month's swap and I still haven't done mine. I better crack on with that right now. But before I go I just want to say a big thank you to EllieK for today's sweet flower and also to Mommaduck for her little bunch a while ago (sorry I neglected to thank you earlier) and also Doris and Shannon. Thanks for the tip, Diamant. You're right, it looks much better now. I spent last Sunday getting to know the basics of EQuilt. I'm sure you're familiar with it, it's design software especially for quilters. 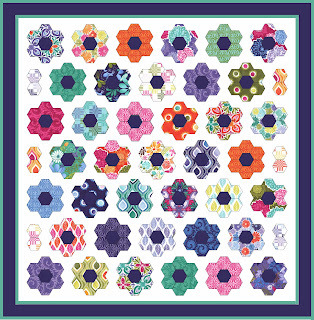 I could so easily get side-tracked for hours playing with the hundreds of different block designs. But I had a specific task that I wanted to do, so this morning I went back to using the regular graphics program that I was familiar with, and this is what I came up with. I've always been the first to say that I am not a designer. I have talented hands and a talented brain but not talented eyes. What I mean is, I love making things and I love figuring out how other people make things, but I just don't think that I have fresh new ideas or an eye for colour. But I still wanted to give it a go. After all, everything can improve a little with practice, and I'm not planning on being the next great new designer. I thought my first effort looked crowded. 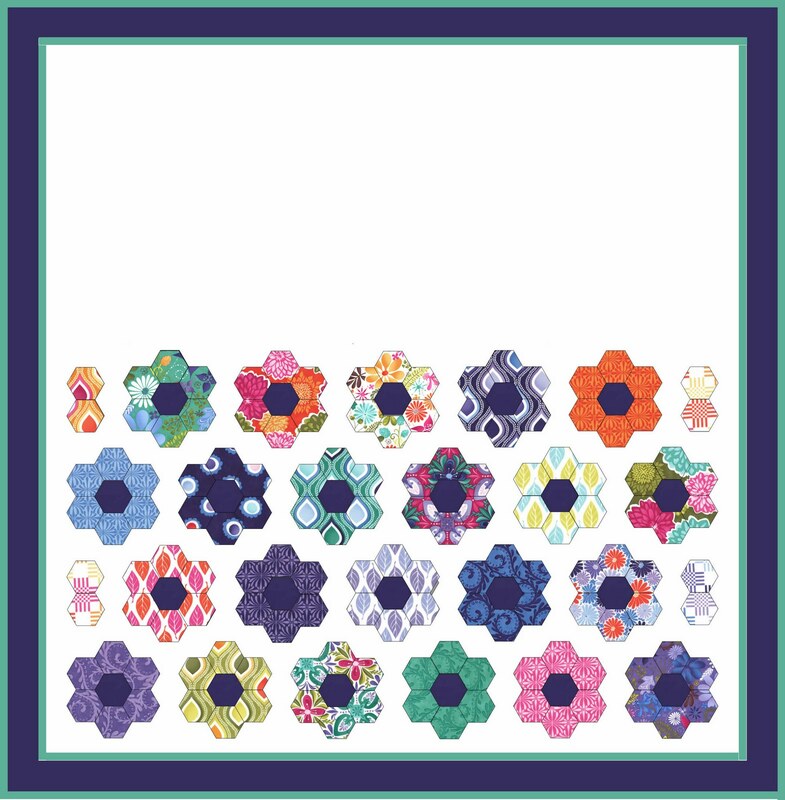 Maybe that's because in the past I have been too timid about using bright bold palettes like this (I think starting the Candied Hexagon quilt cured me of that though) and maybe I'm just not used to the busy-ness. I am happier with my second effort which has some breathing space in between the flowers. This layout measures approximately 90cm x 90cm, not including the borders. I guess my next computer task is to set up a larger version, or maybe do one in another fabric range, but I'm itching to do some stitching so that's all going to have to wait. I haven't picked up a needle all week! 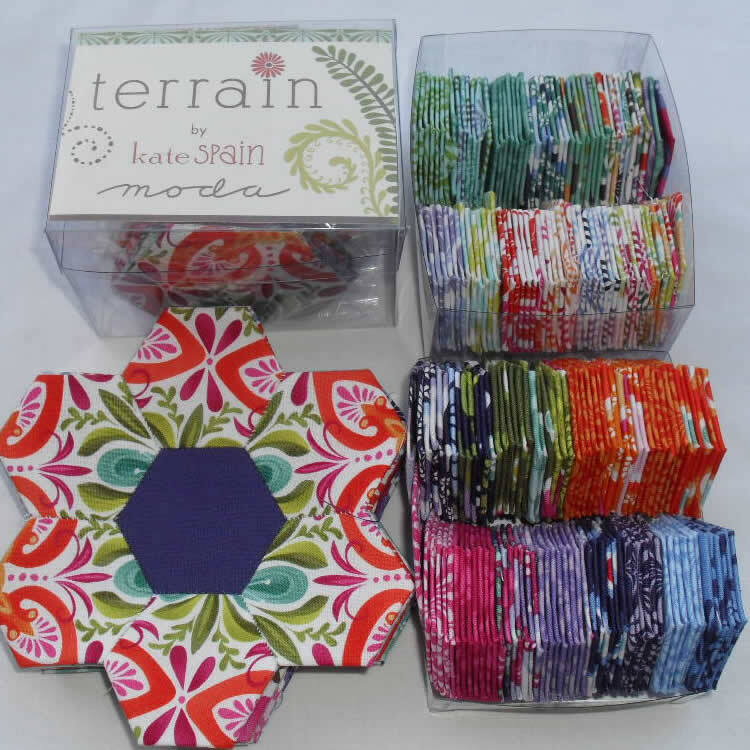 Just a quick post tonight to let you know that I have (finally) made some pre-cut fabric hexagons in the fabulous Terrain by Kate Spain. Sorry I took so long! 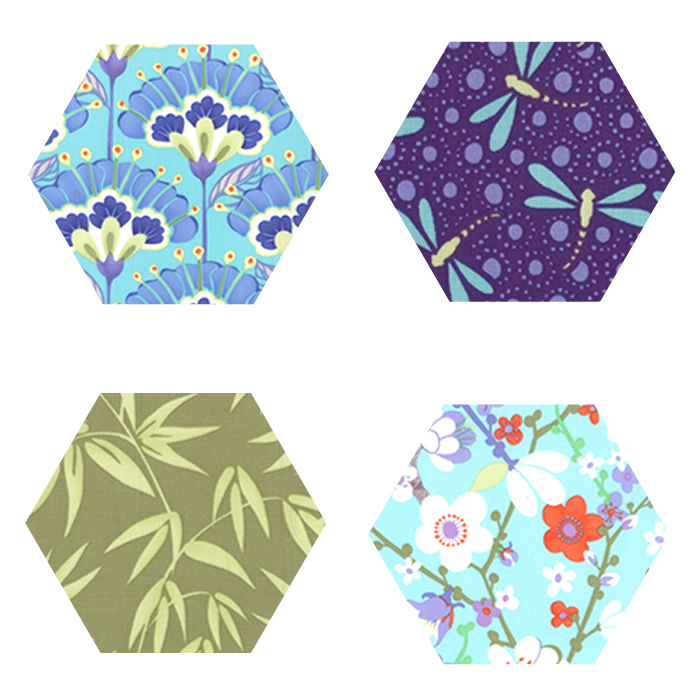 I have die-cut these in the 1 1/2" size, perfect for your 1" hexagons. 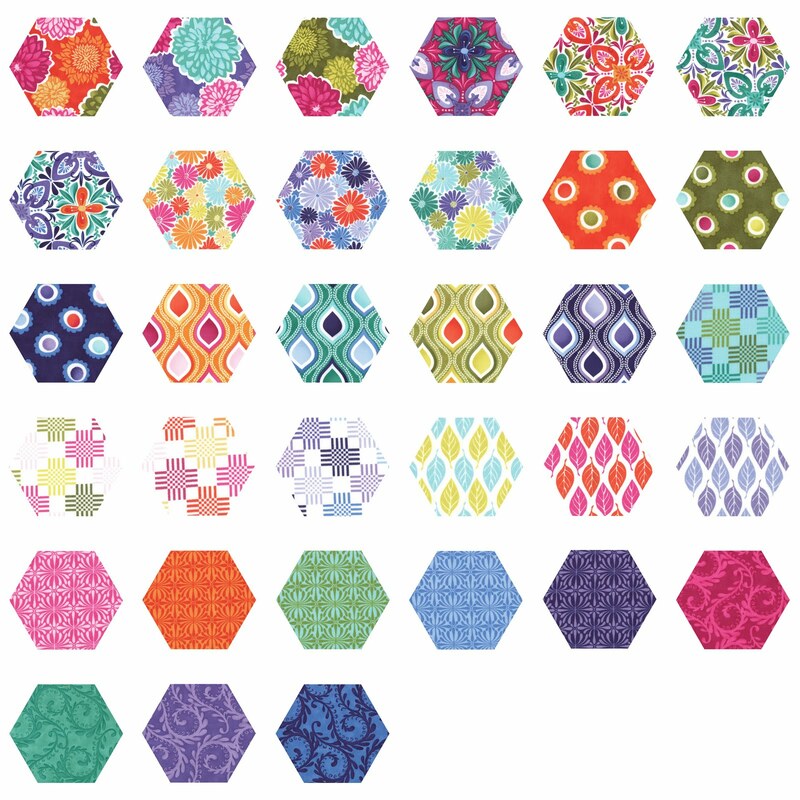 The pack contains 294 fabric hexagons (that's 7 from each layer in this Moda layer cake) for $34.00. You can find the pack here. I think the bold patterns in this fabric range would also look great in the larger sizes and other shapes too. If you have a particular size and shape in mind, let me know if you'd like me to die-cut some for you. It is taking all my strength not to break open a pack for myself! I am dreaming of making a large stuffed dinosaur and calling him Terrain-asaurus Hex! I hope all you Aussies out there had a great 3-day weekend. Well, 3 days minus 1 hour for some of us, due to the start of daylight saving. Back to the daily grind tomorrow. I've had quite a productive weekend, but I'm not quite sure how much to tell you about it. Still, I've been a bit quiet in blogworld lately, so maybe I should explain why. I have a secret obsession and I know it's weird but if I don't give into it every now and again, it just gets worse until I do. There isn't a fancy way to describe it. I like making things from things other people throw away. I like the whole idea of turning rubbish into something useful. That in itself isn't weird. I know a lot of you out there like doing this too, whether it's upcycling vintage clothes, giving beat-up furniture a lick of paint, or using found objects to make jewellery.